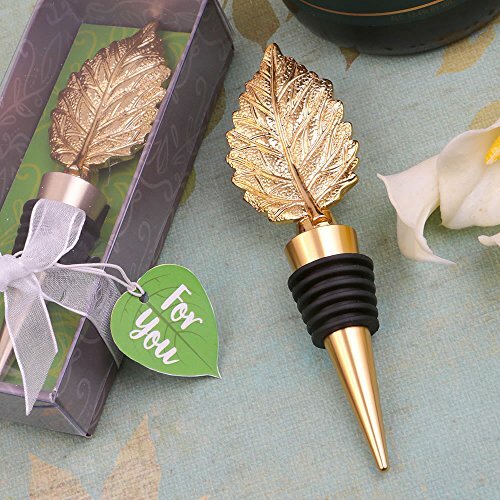 When the leaves turn into beautiful fall colors, capture the essence of the season with this charming gold colored leaf metal bottle stopper. This classic leaf favor in gold tones will add a warm element to your event, even if the weather outside is turning cold! The leaf is crafted from polyresin and hand painted in a luscious gold color. The leaf sits atop a sturdy metal bottle stopper. The bottle stopper has a gold plated finish and a black rubber gasket for a tight seal. Look no further for your perfect fall theme favor. Also great as a gold glitz theme party favor. Box wrapped with white organza ribbon wrap and bow. Attached to the ribbon is a leaf shaped 'For You' tag. A lovely sophisticated favor for a fall themed event!